This utility updates the DPF-D72N firmware to version 1.08 and resolves an issue where the shooting time may not display correctly when using the Time Machine slide show feature. This update is only for DPF-D72N digital photo frames with firmware version 1.06 or lower. If your firmware version is higher than 1.06, then this update is not necessary. - If version 1.06 or lower is listed: Please proceed with the steps below to download and perform the firmware update. 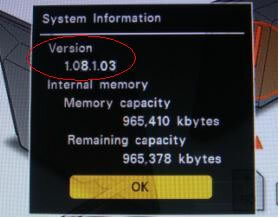 - If a version higher than 1.06 is listed: This firmware update is not necessary. WARNING!! This utility is only for use with the Sony® DPF-D72N digital photo frame. Do not install this utility with any other model. Note: See "About memory cards" in the Operating Instructions for more information about compatible recording media. While performing the update, make sure the DPF-D72N is connected to AC power using the supplied AC adaptor. Loss of power during the updated may cause the DPF-D72N to malfunction and require service. While performing the update, make sure the DPF-D72N and the AC adaptor are placed in a stable and secure location to avoid them accidentally being disconnected. Before performing the update, it is strongly recommended that you back up images that are saved in the DPF-D72N internal memory. Click here for instructions on how to back up images from the internal memory. The steps to install the firmware update are the same whether you are using Memory Stick media, an SD memory card, CompactFlash card, or xD-Picture Card. Download the D72N_V108.zip file to a temporary or download directory (please note this directory for reference). The D72N_V108 folder will be created on your computer desktop. Use a decompression tool to unzip the the D72N_V108.zip file to your desktop. After you have unzipped the file, the D72N_V108 folder will be created on your desktop. Double-click the D72N_V108.zip file. The D72N_V108 folder will be created on your computer desktop. Note: For Memory Stick media, you can use the Sony Memory Stick Formatter software (Windows operating systems only). We do not recommend initializing (formatting) the memory card with a computer, as the DPF-D72N may not recognize the memory card, depending on the initialization format. If you have no choice but to use a memory card that has been initialized with a computer, test it by copying a JPEG image file to it and then see if it displays correctly on the DPF-D72N. Open the D72N_V108 folder on your computer desktop then drag and drop the update files and folders to the root folder of the memory card. Maker sure that the DPF-D72N is powered off. Insert the memory card with the update files into the card slot on the DPF-D72N. Continue to press the "View Mode" button until the following message is displayed at the top right of the DPF-D72N screen. If the above display does not appear on the DPF-D72N screen after a few minutes, or if the display is distorted, remove the AC adaptor from the digital photo frame and then reconnect it. Check that the (power) button lights green, then power off the photo frame and start the update process again from "Update the firmware". Note: If the above display still does not appear on the DPF-D72N screen, please for further assistance. Press the "ENTER" button. After a about a minute, check to see that the following message is displayed at the top right of the DPF-D72N screen. Press the "ENTER" button. The following message is displayed at the top right of the DPF-D72N screen and the firmware update is written to the DPF-D72N. Note: It takes about 1 minute and 20 seconds to write the firmware update. If "No update file found." error message is displayed, the update files are not on the memory card. Copy the update files to the memory card and repeat the Update the Firmware procedure. If "Update failed. "error message is displayed, the memory card has come out during the update. Power off the digital photo frame and repeat the Update the Firmware procedure. Repeat the above procedure several times. Initialize (format) the memory card again and repeat the update process from the beginning. Try to perform the update using a different memory card. If the issue is still not resolved, please for further assistance. When the completed message is displayed, power off the DPF-D72N. Remove the memory card from the DPF-D72N. If version 1.52 is listed the update was successful.